Tokyo Skytree, the world’s tallest free-standing tower, is already a Sumida Ward landmark and will become even more so when it opens in May. The tower is a key installation for digital terrestrial broadcasting and is expected to draw hordes of visitors to its observation platforms and entertainment complexes. Earlier this month various plans were unveiled for illuminating the tower and piping sound through the top observation deck. On the first floor will be a 45-meter-long digital display highlighting the geographical features of the landscape below from the Edo Period up to modern-day Tokyo. Why does Tokyo need the new tower? One of its main purposes is to broadcast clear television and radio signals without interference from the skyscrapers of central Tokyo. It will also replace the now-obsolete analog signal transmission role once provided by 333-meter-tall Tokyo Tower, which opened in 1958. 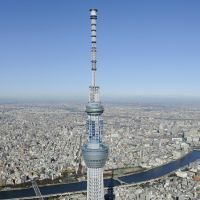 Tokyo Tower is not tall enough for digital terrestrial TV broadcasting because of the continuing emergence of high-rise buildings in its vicinity. In 2006, broadcasting firms agreed that a tower more than 600 meters high was needed, and construction of Skytree began in July 2008. The tower is scheduled for completion by the end of the month and will open to the public on May 22. When did Tokyo Skytree take over the title of world’s tallest? The tower gained the status last March. The original plan called for Tokyo Skytree to be 610 meters high, the same as Canton Tower in China. But after the Chinese tower debuted in September 2010, the pinnacle of Skytree was raised by 24 meters in 2011. The tower was capped at 634 meters because the Japanese syllables for 6 (mu), 3 (sa) and 4 (shi) spell out Musashi, the old name for the district in which it stands. The Musashi district once ranged from downtown Tokyo to parts of neighboring prefectures. The third-tallest free-standing tower is the 553-meter CN Tower in Toronto, built in 1976. Excluding towers, the tallest structure in the world is the 828-meter Burj Khalifa in Dubai, United Arab Emirates. 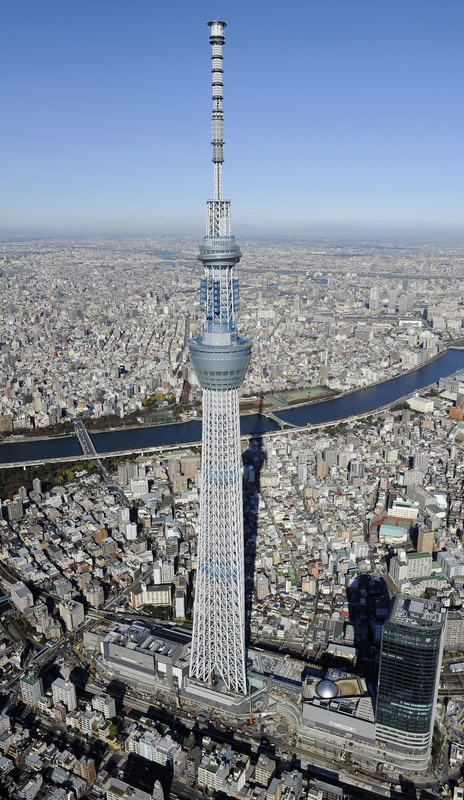 Can Skytree survive a massive earthquake? The tower is designed to ride out major temblors. The main internal pillar is fixed to the outer tower structure up to 125 meters aboveground, but the pillar from 125 meters to 375 meters is attached to the tower’s frame with oil dampers, which act as cushions when the tower shakes and can absorb 50 percent of the energy. Another type of damper is in place at the top of the tower. What previously occupied the site of the tower? It used to be a Tobu Railway Co. freight yard. Goods brought in from northern Kanto bound for Tokyo or points farther on used to be offloaded here, with some loaded onto freighters. The yard closed in 1993, mainly because the railway ceased freight operations. How is the new tower changing the area? The shopping complex Tokyo Soramachi is being built along with Tokyo Skytree. The complex boasts a cinema, aquarium and more than 300 apparel and sundries outlets and restaurants. 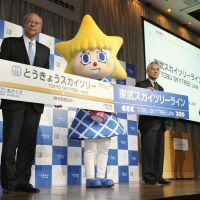 Tobu Railway, the developer of Skytree, is forecasting 5.4 million visitors this year, and for the next 30 years it expects 2.7 million on average every year. Along with the opening of the tower, nearby train station names will change. The nearest is Narihirabashi, which was named after Ariwara no Narihira, who wrote a well-known tanka about the area in the ninth century. 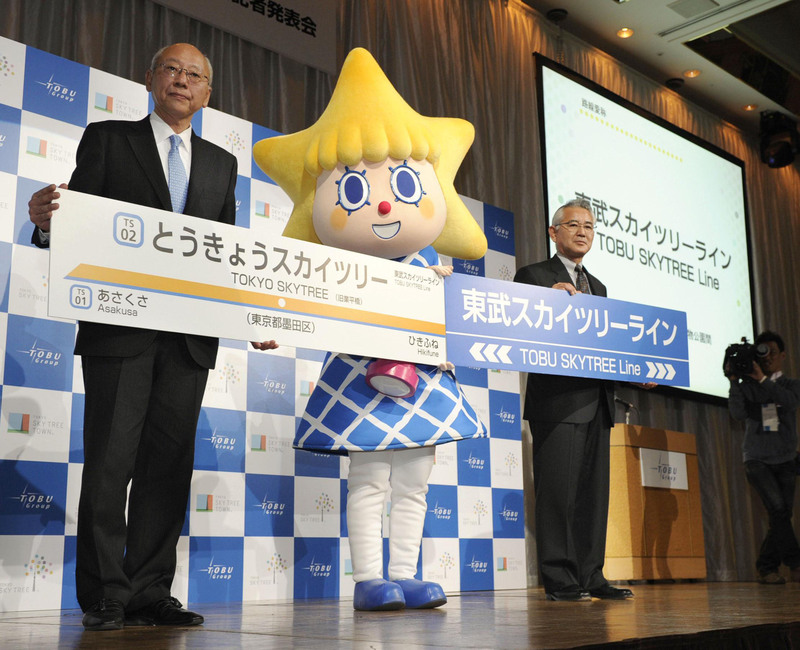 How has Skytree changed the local business situation? Nearby stores have already jumped on the bandwagon, selling goods and foods with the tower theme, and shape. A “soba” (buckwheat noodle) shop sells a towering “don” (rice bowl) with three large shrimps. A bakery boasts a Skytree Danish pastry shaped like the tower. Shiseido Co. said Feb. 13 that it will start selling an original perfume bottled in a Skytree-shaped crystal container on opening day. A 30-ml bottle of perfume will sell for \63,400, based on the tower’s height. Shiseido plans to sell only 634 bottles. The fragrance incorporates two contradicting elements ? the nostalgic and the modern ? the cosmetics maker said. Travel agencies meanwhile plan to offer package tours. For example, Hato Bus Co. plans bus tours that take in Tokyo Skytree.